The catalogs are coming! The catalogs are coming! Must be the end of the year... so far the Burpee and Tomato Growers Supply Co. seed catalogs have arrived in my mailbox, and I suspect they're only the beginning. What I love most about these catalogs isn't actually the plants they offer (although Burpee's "Red Lightning" tomato is awfully pretty); it's that they get people excited about gardening in the dead of winter. Frankly, it doesn't matter whether "Fresh Salsa" or"Halley 3155 VFF Hybrid #4538" makes a better bruschetta. What matters is which photo and description gets you out in the garden scouting for a sunny site and poking seeds into the ground. Next up should be the Seeds of Change catalog, which I think surpasses even Burpee for showing gorgeous companion flowers and perennials in addition to edibles. What's your favorite mail-order seed or plant company? Today is the winter solstice -- the shortest day, and longest night, of the year, which means it's a great time to think about your landscape lighting. Ideally, your lighting achieves a few objectives: it guides access; it provides safety and security, and it reveals new aspects of your garden's beauty. There's no shortage of books on the subject of illuminating your landscape. Most will describe types of lamps and equipment, and design principles and techniques; some will also provide pointers for the do-it-yourselfer on installation and maintenance. Apparently there are even some "trade secrets" and "advanced trade secrets" to had! Divide your lighting system into a number of different circuits. For instance, you probably want to be able to turn off the lights around your hot tub, for stargazing or privacy, without plunging the rest of your landscsape into darkness. Be flexible. Use only 2/3 the capacity of each transformer; install extra conduit and wire for future expansion; install extra receptacles close to your home and entertaining areas for holiday lights, temporary light fixtures, portable electronics, and so on; and install extra-long runs of wire to each fixture so it can be moved if necessary to accommodate mature plants or different placements. Keep it simple. The more exotic your fixtures, the more difficulty you'll have replacing any broken or malfunctioning ones; and the more complicated your system, the more difficulty you'll have troubleshooting or reconfiguring it in the future. Don't overlight. If everything in your garden is lit, nothing stands out. Use fewer lights more carefully to ensure maximum effect. Think of lighting in terms of "layers," creating a background, foreground and focal points. And avoid glare: light should never shine directly into eyes or across property lines. If you're just installing a new landscape, or have more complex needs than some simple uplighting or downlighting, consider hiring a landscape designer or professional lighting designer -- the money you spend will more than pay for itself in terms of peace of mind and overall effect. Some lighting manufacturers will also design systems for you, and even arrange for "previews" of your system so you can fine-tune locations and effects before final installation. I've been invited back to film another episode of HGTV's "Landscape Smart" -- apparently the last one was pretty well received. This time we're working with homeowners who have two very energetic kids and two very energetic dogs, so the yard has to be as tough as it is good-looking. 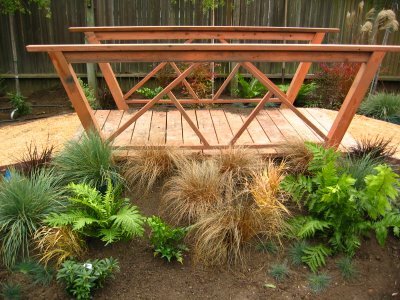 We've installed a bike/play path of decomposed granite, with a faux bridge atop a constructed berm set with flowing plants to create the illusion of water (since neither standing water nor a dry creek would be the safest thing). I'll have more 'after' shots to share with you in a few weeks... stay tuned! Soon it will be time to cut your warm-weather perennials back almost to the ground, if you haven't already -- and with all those flowers and foliage out of the way, you'll probably see a lot more of your garden than usual. But what, exactly, do you see? If your garden were exclusively perennials and annuals, you wouldn't see much more than bare ground. On the other hand, if you've got evergreen shrubs, statuary, sculpture, or structures in your landscape, your eye would have plenty of places to light on. These are the "bones" of the garden: the elements that remain constant even as the plants around them grow, change and die. They bring form and order to your space, and they inspire the imagination even as their context changes. As you cut back your garden, keep an eye out for spaces that have a "barren" look or feel to them -- these are the prime candidates to receive a little bone structure. Other opportunities exist at bends or forks in pathways; intersections of sight lines (from two different windows, for example); or the perimeters of entertaining spaces. But be judicious in your choices: too many focal points, and nothing will stand out.